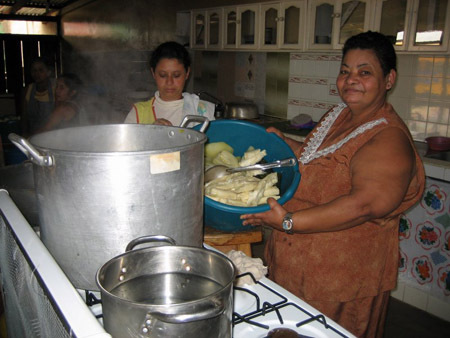 "During our experience in Nicaragua, we interviewed families in their homes in rural Jalapa. This off-campus experience allowed students to move from the theory of studying books into the reality of life in another culture, experiencing this with all their senses. I enjoyed watching the energy with which they engaged themselves in the project. An interim like this provides students with an understanding of people whose lives are very different than their own. This, in turn, allows the development of deeper empathy and compassion. Learning from the Nicaraguans and from each other, each student seemed to change inwardly and outwardly as the days passed. 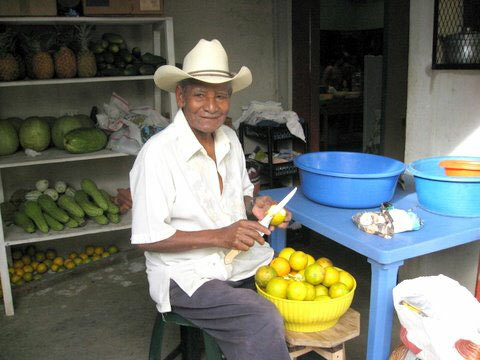 Experiences like the interim in Nicaragua act as a touchstone from which values and daily choices are better understood. We understand our life goals and daily pursuits more fully when we step outside of the assumptions of our culture and familiar routines. What we learn from others, especially in another culture, broadens our understanding of the world, who we are, and what faith calls us to be. We have walked, touched, seen and heard. May we be moved to live each day from a more just and compassionate center." "Ultimately, this experience was life changing. I'm more confident and excited to continue on in the process and education of becoming a doctor, I hope tht I will be able to return to Nicaragua in in the future and serve when I can, where I can and whomever I can. I don't think it's really possible to have realized and experienced something like this and have it stop here. I've learned what types of organizations and ways of serving can change things and improve people's lives, especially when help is provided in the right way. At the same time, an individual can only do so much, but that doesn't mean you can't make a difference." "A real highlight of the trip was getting to be a part of the education scholarship ceremony. Ever year, ISLA gives out more than 150 scholarships to student from all over the Jalapa school district, giving them the means to continue with their education when they normally would not be able to. About 300 students and their families packed into the auditorium dressed in their best clothes with their parents beaming at them. This year was extra special beecause this ws the year that the very first class of ISLA students were graduating from the beginning of their ISLA education scholarship. Many earned honors with some proceeding on to college. We take a lot of things for granted in the US and education is definitely one of them. I can't imagine what I would do if the last formal education I had received had ended in third grade. The children in the Jalapa district have so much potential and it was unbelievable to think that it could all be taken away because they have to leave school to go to work in the tobacco fields. It was marvelous to see how dramatically a scholarship could change a child's life and improved their future." "By bringing together ISLA and St. Olaf College we brought fresh faces and energy to the program...It was pretty remarkable to think we were acting as ambassadors from the United States. We hope we showed everyone that the next generation does care about world issues and that they can have faith in us to continue the teaching and mission of ISLA and other organization like it." "I would like to share some of my personal thoughts and career planning after this experience. Searching for assets in each community, thinking of ways to empower and help each community to continue sustainability, and getting to know the communities at a personal and individual lever empowered me. Merely providing medical assistance or even meedicine is not long term for a developing country. It fascinated me to discover what else we were able to do. I was also inspired by the power of education. Not only to see the effects of education being valued and encouraged in a community, but also to see the power of it on the individual bases." "The survey experience (going door to door in the surrounding communities of Jalapa) has provoked many thoughts on poverty. The aspect that really angers me is the socioeconomic inequality among the people in the world. It is unjust that some should live in extreme poverty while others roll in affluence, especially when there is no foundation for distribution. For example, I had the fate of being born into good circumstances, while someone else is born into poverty in a community around Jalapa. I do not deserve what I have, and what I have is not based on merit, and this is likewise with the poor person. Often times, being in poverty is part of a cycle. 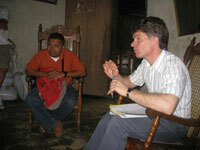 In one of the communities, we surveyed a family who lived in a small home. There were dirt floors and two beds for ten people. The family relieved themselves in the field behind their home because they were too poor to own a latrine. Some of the kids were not wearing shoes or pants. The mother had no education, and she could not even afford to send her children to the primary school. Therefore, those children will grow up without education and will have disadvantages when entering the work force. They will most likely have children and riase those children at the same level of poverty. For me, it is different because I have opportunities and choices which allow me to receive higher education, the luxury to travel, and the luxury to visit an impoverished area and leave whenever I want. Most of the time, people are trapped in poverty and the vicious cycle, unable to leave unless there is outside help. I think I see now that we are trying to break the cycle in any way that we can, even if it is just small, through surveys that will possibly provoke public health education. This experience and a partial understanding of poverty is a motivation for me to do more work. Because I was born into a financially stable situation, I have an obligation to use my resources to even out the differences and share those resources with the poor to help break the cycle..."
We are both so excited to be able to share a few thoughts about the ISLA mission trip we took to Nicaragua last year. We have to be honest we were very skeptical as to (What do we have to offer?) however after some prodding and encouragement from Nancy Carlson we committed. It truly was an experience of a lifetime and one we hope to share and encourage others to take part in. We both came to realize the importance of sharing and giving of your time and what it means to those so much less fortunate than us. People is what it is all about, from getting to know and work with other Bethel members better to showing a Nicaraguan how to properly hold a hammer or the joy of being able to see with the new pair of glasses. Trust us the rewards are plenty and most of them come in the form of hugs and smiles. 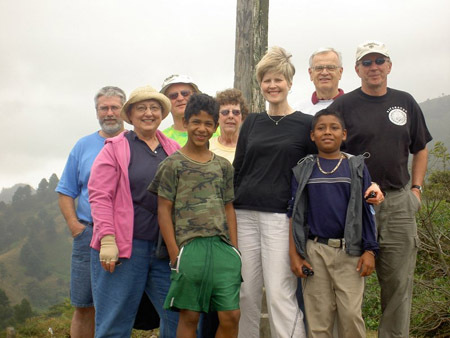 Let's show that Bethel giving spirit and join us this spring in Jalapa. Con este gesto tan hermanado. Ha sido un alivio para esta mi operación. Welcome my good friends to this place of borders. God bless you from heaven above, brothers and sisters from the United States. Your visit has been a blessing, and that’s written in our hearts. Jalapa looks happy with that gesture of your friendship. My family is grateful for your group effort and sincerity. Let us not forget this gift and also those who come. My words are of gratefulness for you humanitarians, brothers and sisters. We pray that God will bless His people for such a great group effort. You come giving tenderness – a mysterious gift. You also play with kids, teaching us how to love children. At last my final words, with respect and great devotion, thank you for your donations that made my operation come true. My trip to Jalapa was an eye-opening and humbling experience. I’ve never seen such happy people who have so little. Looking at my life compared to theirs, I’ve got it pretty easy. Doing service work for the people felt really good. Many of the patients walked for miles wearing no more than cheap flip-flops through mountains and rivers just to be seen by the team. The efforts made by the patients showed how the Jalapans appreciated ISLA’s team and the care we provide. On this trip, I assisted in setting up a wound clinic. While seeing patients in the wound clinic, we had to adjust our instructions for cleansing wounds because for many even soap is not available. The educational instructions given to patients to care for their wounds required a lot of improvising. 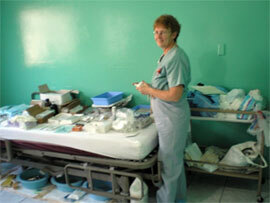 We supplied patients with gauze, antibiotic ointment and other supplies required for wound care. This clinic is a great addition to the services provided by the hospital nurses and supported by ISLA who will continue to provide needed supplies. My trip to Jalapa, Nicaragua was a wonderful experience. I'd go back in a flash, and I feel very blessed to have been a part of this wonderful team. I was moved by the people of Jalapa who are good, smart, and joyful individuals. Through my experience I learned we can’t survive without each other. I truly felt the joy of making a difference. 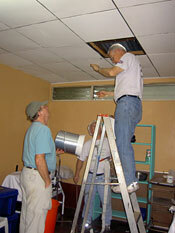 Thank you for your prayers and support during our recent trip to Nicaragua. We appreciated the chance to travel to a different country and learn about the culture and people of Jalapa. This was my third trip, and after my first one, I knew it was very important for each of my children to experience this life-changing journey. Kelsey has been able to go twice, and this was Kevin’s first trip; he knows he’ll be going back many more times. 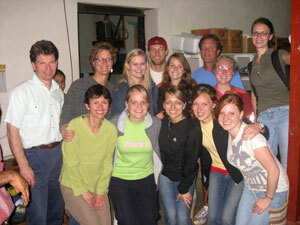 The things that we worked on this time included focusing on a school forty-five minutes from Jalapa. The drive there included a river with no bridge and a very remote location. We repaired a roof, patched holes in walls, painted the whole school inside and out, inserted transparent panels for light (as no electricity was available) and made structural repairs. We thought of Bethel as we worked, because one of the first aid kits for which the Sunday School raised money was hanging on the wall! We also worked in the local hospital, constructing bookshelves, painting the front exterior wall and an interior wall, and helping re-arrange rooms. Returning to Jalapa, we saw how many connections we have to the community and look forward to returning and strengthening those friendships. It is not only the bonds with the Jalapans, but also with fellow members of our church on the trip that keep us going back. Many people tell us it is a good thing we are doing, but we think it is a good thing we get to do. I have been to Nicaragua a number of times with ISLA. Each trip and each team is special. Some teams are small in number like our last team of 8 and some teams have been 35 plus members. The unique part is that on each team, members are of different ages and from different walks of life and yet on these trips we are all here for the same purpose - to help others and all of our differences and our different beliefs don't matter. Each team reaches great goals. It is my hope that after each trip each volunteer will feel more enriched because of their experiences and the people they have met not just on the team but also the people of Jalapa.